Holaaaa !!!! How was your week ?? It’s getting colder because rainy season is comiiing... Make sure you wear warmer clothes and take care of your heath, okay? Another lippie product review. I’m really excited to announce my new tint. It is from the most favorite make-up brand of mine. Yep Peripera!!!! So if you follow their feeds, they have so many interesting lip products to try. They also recreate the Peri’s Tint Water design. It looks fancier and more like ‘Peripera’. I really become a fan of Mari Kim. I got this cute looking tint. Well, i think calling it tint is too rude because it is ink. It is something new for me because i’ve never seen tint with formula like this. It is more than just tint. Beauty attracts eyes, so does this bottle. It has dropper -like bottle. But if you imagine squeezing the cap like you squeeze rubber dropper, nay nay, it is hard because it is plastic made. But still it is kawaii. The tint is glass-made. I think you don’t have to worry about peripera’s bottle quality. I’ve even dropped my peri’s tint water from second floor and it was totally fine. Just feel free to drop it anywhere anytime you want lol. What should i call the applicator? It is doe-foot but a bit flat. I don’t mind about the applicator anyway. As long as it can transfer the product well. The tint is rather watery than creamy. But still it is cream like and have an amazing pigmentation. Since it is ink, i think the longevity becomes the issue. Yes it is long-lasting. But the problem is, it is over long-lasting even Peripera have its remover. You know what will happen if there is even a special remover for specific product. The removing session becomes the hardest part ever. I tested it in my hand and it stained a lot. I tried make-up remover that can even remove waterproof eyeliner. I tried scrubbing it. But the stain still there. If you are going to do lip tatto, i suggest you to just buy this ink lol. p.s : I just found new method to prevent its over-lasting stain. Before i put the ink, i layered my lips with lip balm beforehand. Not only making moist and smooth surface to begin, but also give the lips extra shield to prevent the tint to be over sinking. It works! Usually, after heavy eating, the ink is still there. But when i use this method, The ink is cleared so much better but still gives its pretty stain. So i think i don’t have to waste money on its remover. The color is really pretty. Actually, i’m aiming for number 3 but the seller gave me the wrong shade. She gave me shade no. 1 ( It Lips). I never get interested in pink shade when it comes to make-up so i asked to return. But unfortunately, the shade which i want just sold out. So i took this shade over others. It is not me. It is my friend. I want to give you a picture of how it'll appear on fair complexion person. I think it suits better in person with clear complexion. It is blue based red. Not shanghai red. And it does suit better on people with cool undertone. Mine is warm so the color doesn’t suit my face at all. I like the color anyway but it is too bright. The stain is too hot pink lol, make me look like an ahjumma. I also have the latest tint from Etude House, Dear darling water tint in Orangeade. 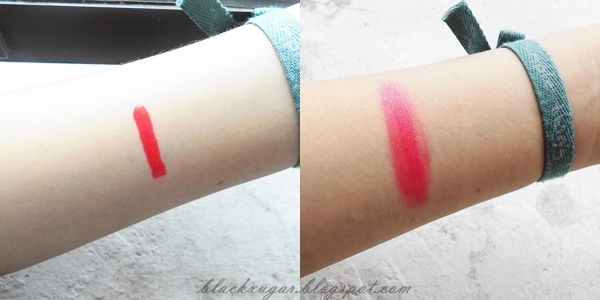 After i use Peri’s ink, i combine it with etude house water tint to tone down the cool shade. Now it is a thing. I love the color. Other blogger said that it is drying, but strangely, my lips feel smoother after using this. I don’t even get it wkwk. But there are tons of method to prevent dryness. Yes, i do recommend it. I’m going to buy another shade but it still sold out everywhere.. 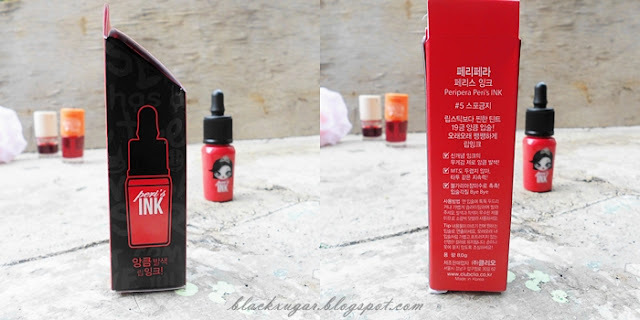 So have you tried Peripera Peri’s Ink ? I want to have Lumi Pang for sure. 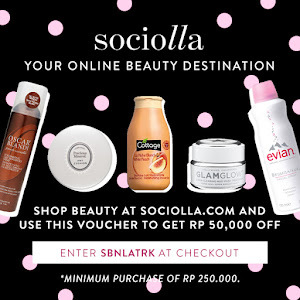 Beli di..... bisikin lewat email aja yaa ^^ Sure, followed yaa..
Mau tau donk dmna belinya..
Ko murah yah:( pengen tau dong ka belinya dimana..
plz send me an email. Ka beli dimana? Share infonya dongg..
Ka mau tanya belinya dimana, makasih. halo boleh tau kamu beli dimana? Kasih tau dong, beli dmna ? ?